Did you see Gandalf the grey bunny over att Disapproving Rabbits recently? He is so cute where he sits in the leaves! Here in Sweden, Autumn is passing rapidly. It is getting colder, and a few days ago we had frost in the morning. This entry was posted on Saturday, October 3rd, 2009 at 3:36 pm	and is filed under Bunnies. You can follow any responses to this entry through the RSS 2.0 feed. You can leave a response, or trackback from your own site. Gandalf is a very beautfiul bunny. I hope he likes to hop around in the leaves! 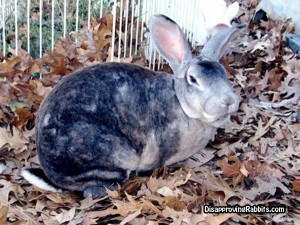 He definitely looks like he does not like to be disturbed when he hops in the leaves, so I think he likes it a lot! No frost here yet for some time … we are having a beautiful Fall. Then in mid-November it gfets gray and leaden skys and drizzle and damp until MArch!! !